What a way to kick off the holiday season! 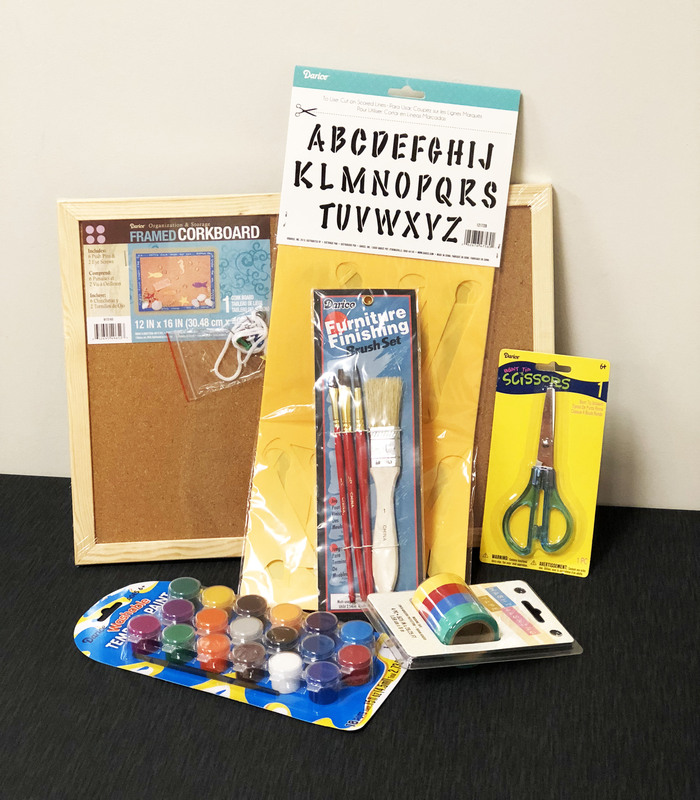 We recently received a grant from Penrod Society that enabled us to provide all students in our tutoring program a bag of supplies to create artist-inspired bulletin boards over winter break. To me, a bulletin board represents a fresh start and a space to post anything I want. Things that represent me. Things that I find interesting or unique. Some people use them to stay organized and on top of things, posting calendars and reminders. Whatever the use, I hope the materials provided inspire students to personalize these bulletin boards and make them their own. 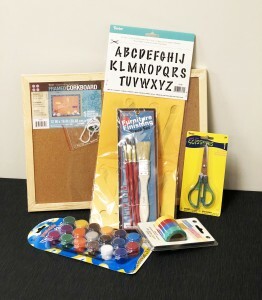 The bags of supplies include paint, brushes, stencils, scissors and washi tape. Also provided are examples of two artists who use the elements of line, shape, and color heavily in their work. Sonia Delaunay was a clothing designer who used geometric patterns to design the actual fabric for her wearable art. Piet Mondrian was a painter who limited his palette to the primary colors- red, blue, yellow and achromatic colors- black, white, gray and arranged these in grid-like formations. 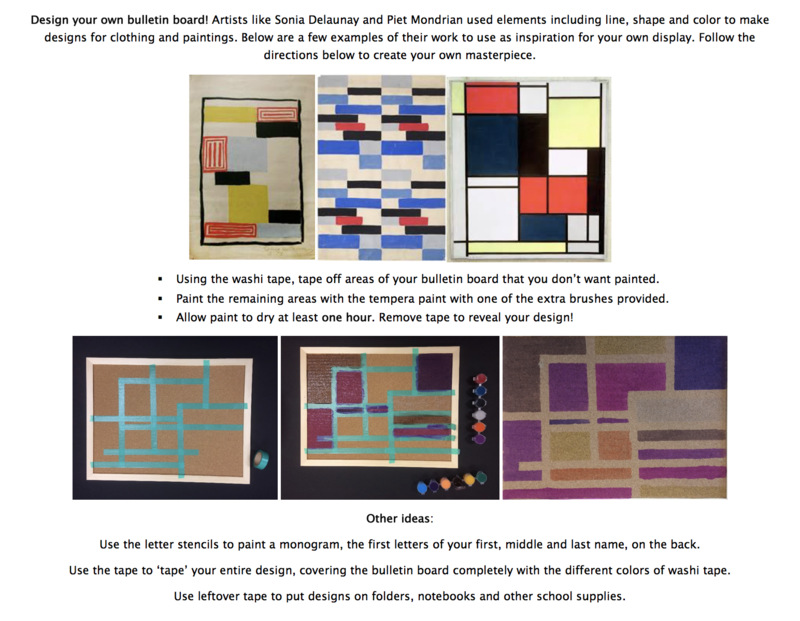 Their work translated into possible ideas for bulletin boards; using tape as a resist and blocking off geometric areas in which to paint. Student have the options of limiting their color choices or using all of the 18 colors provided. Once the paint has dried, they can remove the tape to reveal their design. Doing these kinds of creative activities keeps the brain engaged in many ways. Kids get a sense of control over the outcome of a project. They get to make choices about what goes where, what they think will look good and identify what they like. It involves two types of thinking: divergent and convergent. Divergent thinking requires the ability to associate and combine different elements, for which an infinite number of unique arrangements may exist. It can be thought of like brainstorming where many ideas are thrown out in an attempt to come up with something new. Another important aspect of the creative process is decision-making, which depends on convergent thinking. Convergent thinking is the ability to think strategically and narrow down all ideas to the best ideas or solution for the project. Kids need to be able to do both. 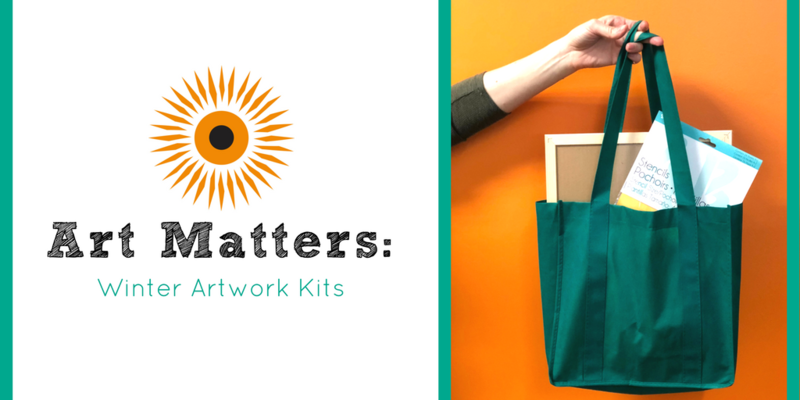 Art can help kids do that. My hope is that during winter break, kids will take some time to think about a few designs, what colors they like and how they want to represent their unique vision. They may choose to go off the grid and explore another set of options. Whichever they choose, they will be putting their minds to work over the long holiday. A special thanks to the middle schoolers from CFI 2 who put these bags together for our kids. This group does great things in the community and handily organized the bags that were going out to our 13 locations. It is great when other kids help our kids and realize they are not that different, just in different situations. Next Story2017: What a Year!